The PF-19 Series of rack mounted 19" Enclosures, like its companion SA Series, is designed for both the industrial and home hobbyists. 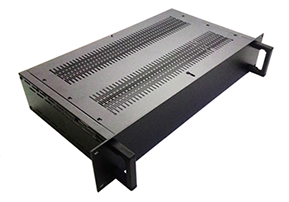 PF-19 is a heavy duty enclosure which can be installed into any standard 19" rack or using the rubber feet provided, set on any surface. The high quality steel body features removable top and bottom panels, which are liberally vented so your components stay cool. The 3.00 mm thick Aluminum front panel is stout but easily worked by the user. Inside front steel plate and multi holed mounting rails, allow for convenient PCB and component installation. Wide range of applications; the PF-19 system consists of 5 sizes from 1U to 5U and 3 different depth. Easy access for user interface. Packed flat for convenient shipment and storage. Inner front panel for component mounting allows outer front panel to remain “clean” appearance. are included in the basic kit. Additional bars may be ordered as needed. 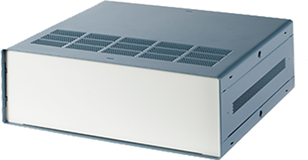 Optional solid side covers for air flow control or decorative look in non 19” rack mounted applications. Premium grade (AL 5052) aluminum. 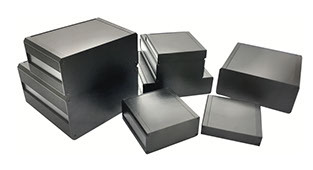 Our SA Series of stand along general use electronic enclosures is highly versatile line of quality enclosures for both industrial and hobby use. The rugged steel body provides easy access to the components being assembled inside. The Aluminum front and rear panels are ideal for end user customization. 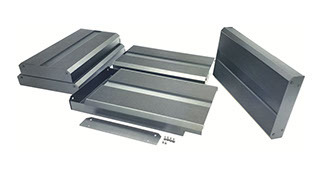 Available in 24 different sizes and configurations, the SA Series enclosures come flat packed and its unique "snap together" design requires only 4 screws to complete the assembly. Powder coat finish precededby 5 stage iron phosphate pretreatment. Two pieces of extruded aluminum component mounting bars for components fixing are included in the basic kit. Additional bars may be ordered as needed. Heights from 1.5U to 5U, conform to IEC-60297-1. from time to time and actual product may vary from what is shown. 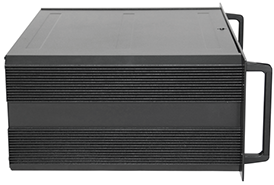 The HS-19 Series of rack mounted 19” heatsink enclosures is a versatile and user friendly 19” enclosure series. Designed for both professional users and home hobbyists alike, HS-19 features extruded aluminum heatsink side panels. The high grade aluminum body features removable top and bottom panels providing easy access to work inside. An inner front panel allows you to mount all your components on it and the 3.00 mm thick Aluminum outer front panel covers it to give your project a professional look. Extruded aluminum component mounting rails are slotted to allow for convenient PCB and component installation. HS-19 is provided with self adhesive rubber feet if rack mounting is not required. Premium grade aluminum sheet: AL 5052 and extrusion: AA 6063 (Aluminum Alloy). Extruded heavy duty aluminum (AL 6063) side frames provide high efficiency cooling and strength. Multiple sizes for any application. Suitable for wide range of Electronics & Instrument applications. Simple and easy to assemble. Black powder coat standard color. Extruded heavy duty aluminum (AL 6063) heatsink provides excellent cooling. Suitable for power amp and other high heat generating application. Robust steel base and end plate.